Halloween is around the corner. I will have to go Trick or Treating with my kids again. My son wants to dress up as a devil. My daughter doesn't like scary creatures and therefore wants to be a fairy. Both my kids want me to dress up as witch again. I must have looked quite convincing last year. 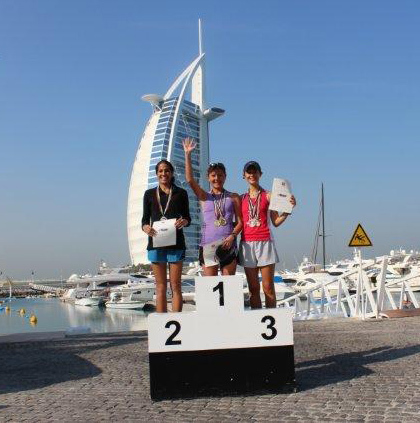 October also means the start of the running season in Dubai. I had a 8k race and a 10k race on the last two weekends. My summer training seems to be paying off. I was happy with my times and even made it onto the podium at the 8k race. October also marks the beginning of my marathon training for the Dubai Marathon on 25 January 2013. The marathon training, more than anything else, means primarily three things: I will run a lot more. I will eat a lot more. And I will need a lot more sleep to recover. The sleep issue is basically solved for me as long as I do my runs in the late afternoon/evening. I have never been an avid morning runner (unless it is a race). So running in the evening, come home to have shower and dinner and then crash onto the sofa or straight into bed has worked quite well for me in the past. After a good nights sleep, my legs might still feel a bit tired, but I can function and my head is clear. Whenever I do run in the morning (especially if it is long runs), I feel tired for the rest of the day. Today was one of those days, where I squeezed in a 19k (12mi) run in the morning. By lunchtime I had splitting headaches, and my body was just screaming for rest and sleep. Needs to be avoided. The food issue: especially at marathon training time, I am glad that I am small and slim. While I run, I do burn a good amount of calories, but by far not as much as a 80kg/175lb guy would burn. I sometimes wonder how much time these guys spend eating. I already spend a whole lot of time in the kitchen preparing and eating food. So imagine that with someone who easily burns double the amount. Food portions increase enormously during this time, and grab-and-go snacks need to be ready at all times: preferably in form of muffins, cakes, granola bars, etc. 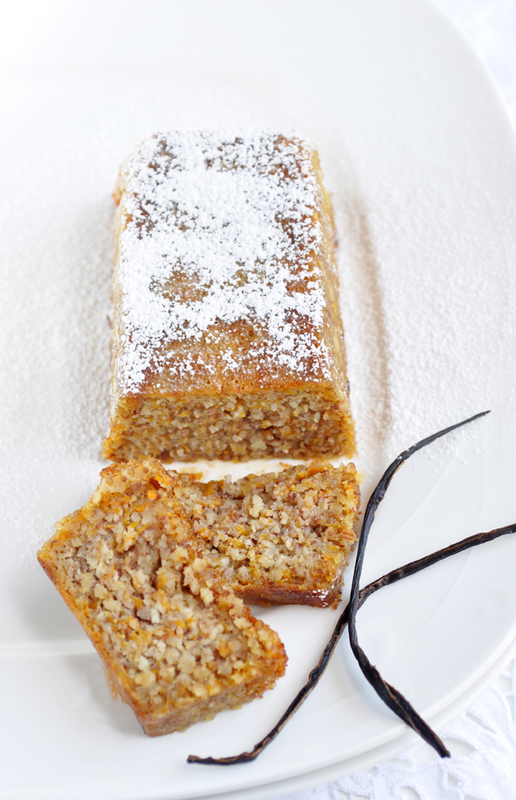 Today's recipe is therefore a grain free seasonal loaf cake with fresh grated pumpkin. The pumpkin is used in the same way, you would use carrots in a carrot cake. The ingredients list is incredibly simple and short. The cake can be whipped up in no time. 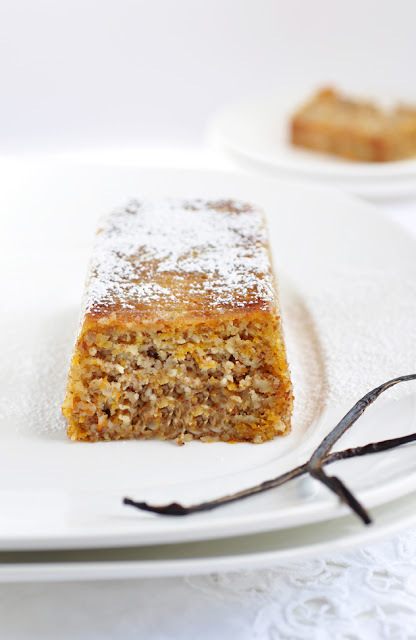 The cake itself is moist and sweet and extremely satisfying as breakfast cake, mid morning snack or as afternoon cake. Enjoy! Preheat oven to 180C. Grease or line loaf tin with parchment paper. In a medium bowl, combine almond meal and baking powder. Set aside. In another bowl, beat two eggs and sugar until light and fluffy. Add coconut oil and vanilla extract. Combine wet and dry ingredients until well mixed. Gently fold in grated pumpkin. Transfer batter to prepared loaf tin. Bake for about 45 minutes or until cake tester comes out clean. Let cool for 10 minutes in the tin, before taking it out. Let cool completely on wire rack.